I have always depleted plasma prior to proteomics experiments. Actually, that isn't quite true. I've always had a qualified technician deplete plasma for me prior to doing plasma proteomics. I feel like I've written about this before, but am too sleepy to look up the entry. Anyway, about 95% of the protein in human plasma is made up of 15-20 single proteins. A good paper on the topic is available here. Nice depletion columns available from a number of manufacturers will use various techniques to pull out these abundant proteins and give access to the lower abundance ones. However, even after depletion, your top hits are ALWAYS from those proteins that should all be gone. You still get 80-90% sequence coverage of albumin, transferring and the various IGgs. In order to really dig into the plasma, you need to build extensive static exclusion lists or use extensive fractionation methods. So I was surprised when I found out that the Biomarker Research Initiative in Mass Spectrometry (BRIMS) Center has a strict policy that they do not deplete plasma. My first thought, of course only shared with myself, was that they must be studying albumin as a biomarker, but this is most certainly not the case. Their non depleted data is significantly better than any I generated with any of my depletion experiments. 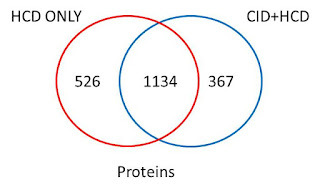 Their thought is that tons of proteins interact with these high prevalence proteins, when they are depleted they take a lot of those proteins with them. 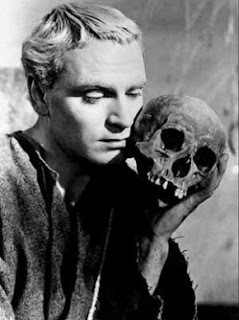 I'm going to look for some literature that has tested the two, or better yet, try to get access to a machine (and a technician who knows how to deplete plasma!) and give it a try. Is the Top10 experiment obsolete? We all love the Top10 experiment. It's catchy, it was one of the original tried-and-true Orbitrap experiments, and since evolution has granted us 10 digits on our paired appendages, it makes the math for us pretty easy. But is it handicapping our experiments? The answer is complex and requires quite a bit of arithmetic. I'm currently sitting in a bar at an airport waiting on a delayed flight, so I did some of the math, but my motivation appears to be dropping for some reason. Right? Moving from a Top 10 to a Top20 vastly increases the number of spectra that you can get. Yes, the QE is fast, but this is HCD scans read in the Orbi. When operating a hybrid instrument and acquiring the scans in the IT, this speed can be comparable, depending on the resolution used. What is interesting here is that after a Top25, we saw diminishing returns. This does make sense. A Top30 method was no better than a Top25, and a Top40 was even worse. Remember that it takes time to do each and every scan, and that by the time you get to scan 31, your peak may be gone. 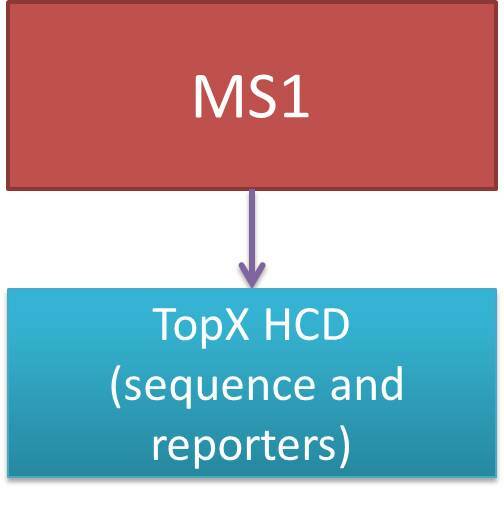 The next 10 MS/MS fills may be focused on ions that have already passed in your chromatography gradient. This is very dependent on the chromatography conditions, instrument speed, and sample load, but good to keep in mind! Additionally, it would be nice to reproduce this experiment on other instruments. I forget the resolutions used on the Elite here, but they were pretty high. I'd love to take a look at a similar experiment ran on the XL and/or Velos at lower resolution. I get this question a lot: What is the best way to do a reporter ion experiment (iTRAQ, TMT) on an Orbitrap? In order to find out, we took human serum, depleted it, digested it and fractionated the peptides with strong cation exchange chromatography. Each fraction was ziptipped, resuspended and separated into two identical fractions. One half of each fraction went into a Top5 method, where the 5 most intense ions were first fragmented by CID then with HCD. The other half of the fractions were fragmented only by HCD, and both the reporter ions and sequence were read in the Orbitrap. The column, gradients, and applicable settings were the same for the Orbitrap Velos that was used. The only real difference was that the samples ran on the first method were ran in triplicate. In my mind, the results aren't even close. In 3 times the run time, the CID + HCD method still lost. 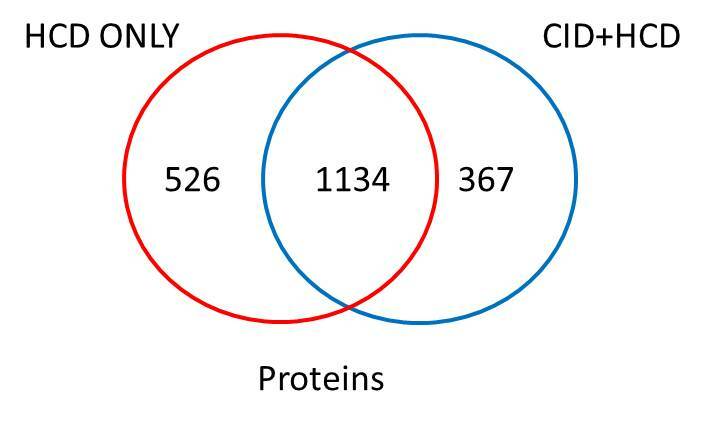 While the majority of proteins were the same, in 1/3 the time, the HCD method turned up significantly more proteins. This isn't the first time I've seen this kind of data. In general, anything that increases your cycle time hurts your results -- even adding a complementary fragmentation method. 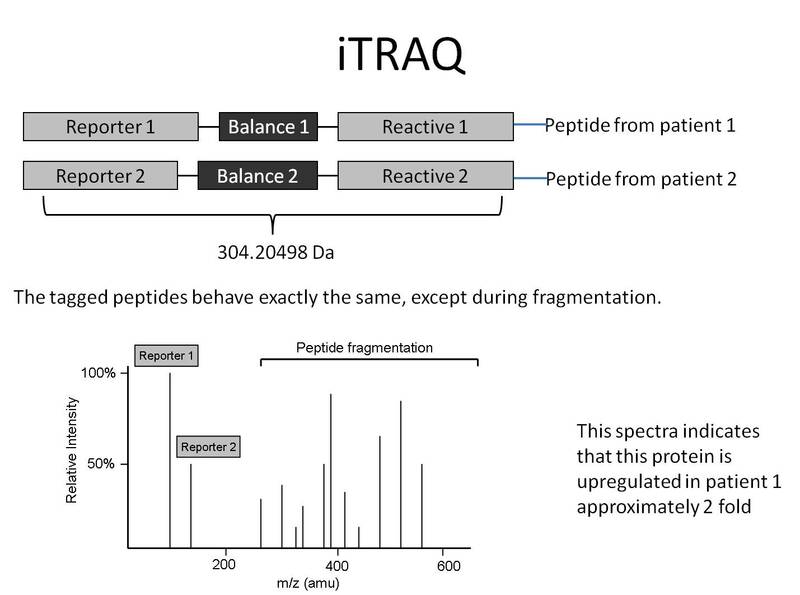 Summary: Use an HCD based fragmentation method for iTRAQ experiments. If you have an Orbitrap Velos/Pro/Elite, use HCD only. For an Orbitrap Discovery or XL, use the CID+HCD method. This paper from Ting et. al., isn't new. It is simply one that is new to me, which is really strange considering the immense amount of iTRAQ work that I have done in the last year or so. The idea is this: When you are looking at reporter ions, such as TMT and iTRAQ, the resulting ions that you are using for your quantification are in the low mass range where there is lots of interfering junk. Also, if you have co-isolated more than one ion species, then you may be looking at reporter ions from both your ion of interest as well from these co-isolated ones. I'm going to take a step back. The following figure is an ideal iTRAQ experiment. In the ideal set up, you only get your ion of interest fragmented and you can trust the above statement. 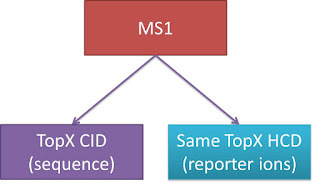 More reporter ion 1 means that this protein is up-regulated in patient #1. The problem is this: Although we have selected a specific ion, sometimes within 1 part-per million (0.01 Da or less, the instrument can only isolated as well as its weakest component can isolate. This often means that when you think you are fragmenting ion 515.01 +/- 0.01, you are actually fragmenting 515.01 +/- 2.0. This allows other contaminating ions in to screw up your ratios. 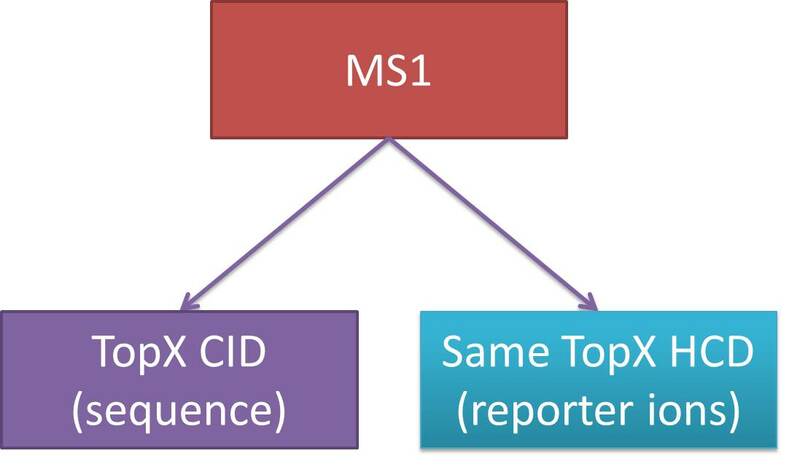 This method goes one step forward and selects the ion again, and does MS3 on it, with the correct assumption that the majority of contaminating ions that slipped through for MS2 will not be able to repeat the trick and be selected for MS3. The benefit is vastly improved quan values. If this is what is important to you, I strongly recommend you read this paper! Unfortunately, there is a drawback. 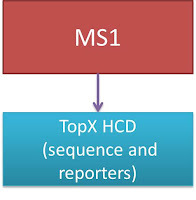 The extra step in getting and isolating the MS3 takes additional time. This is why I doubt I'll ever use this method. In my work, I need to dig deep. The proteins I am looking for are the lowest possible copy numbers. These are proteins expressed by a percentage of parasites that are infecting a percentage of human cells. Would I like better quan? Of course! 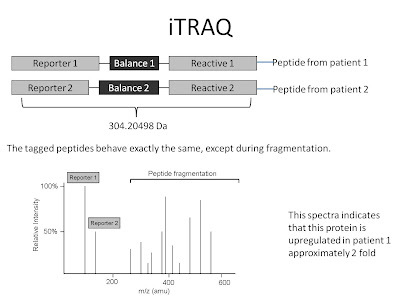 But when I do an iTRAQ/TMT experiment, I am averaging (automatically, in Proteome Discoverer) the reporter ions from a number of peptides from the same protein and then I am looking for pathways, not individual quantifications. 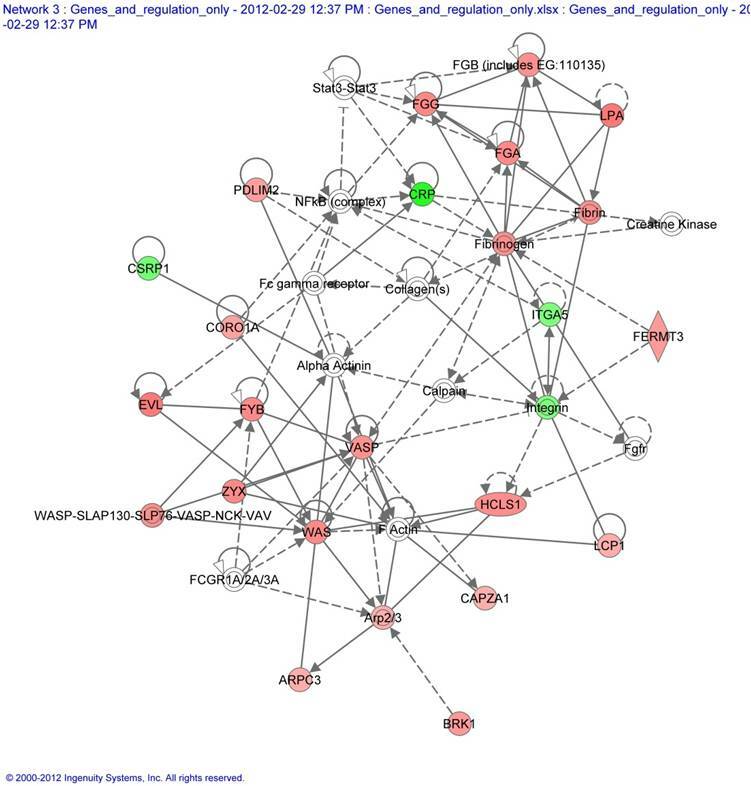 I believe that this pathway is implicated in my disease of interest because multiple proteins in this pathway seem to be affected during infection. Using a method that is more precise, but gives me fewer of these proteins is going to adversely affect my results, in the way that I use reporter ions -- as a filtering method for implicating pathways. Don't get me wrong. I absolutely love the paper from Ting et al., it is just that the drawbacks outweigh the positives for my application of reporter ions. 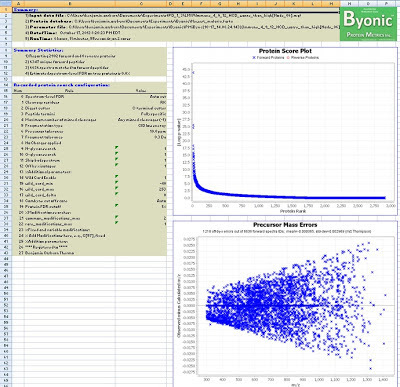 Yesterday I finally had time to run these samples in Byonic. The results are extremely impressive. Extremely. My primary protein of interest in this sample is an large membrane protein primarily composed of large variable regions which are expressed on the cell surface. The first challenge is that membrane proteins are hard to ionize/fragment/sequence in an MS experiment. The second challenge is the high level of variability. Using Sequest on the CID sample with the proper cutoffs will give you 10 peptides from this protein. Adding mascot will give you 2 additional peptides that Sequest does not. Running the same sample with no modifications, except for carbamidomethylation of cysteines, in Byonic returns 15 peptides. With zero modifications, the search is fast. I can't give you a good metric as I currently only have Byonic functional on a 32 Bit Win 7 machine with 3.5 GB of hard drive space. I'll have better metrics after running this on my server, where I have benchmarked processing times for various software packages running this sample. The real advantage is when this sample is re-ran incorporating the 'wild card' search which allows for variations within a user-set mass range. I used the default cut-offs of -40 and +200 Da. The rerun added 7 unique peptides that all appear to have suffered 1 amino acid substitution! So I've moved from 12 peptides in Sequest + Mascot to 22 peptides from my protein of interest, as well as a lead in point to the modifications that this particular parasite has undergone. Another big advantage to Byonic is your report. When the processing is complete, you get an Excel spreadsheet with 3 pages: 1) A summary 2) Your spectra/peptide report 3) Your nicely summarized protein report. 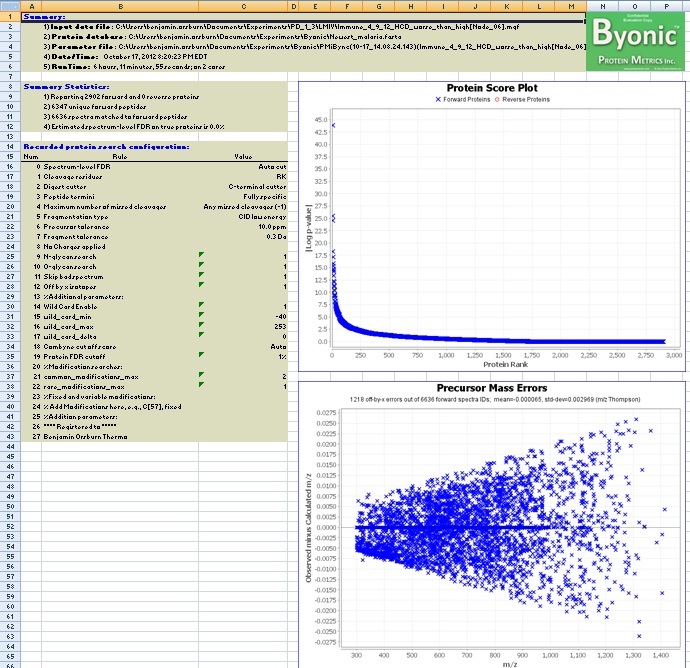 The summary contains a plot of your precursor mass errors and the distribution of your protein scores and other useful information as shown above. 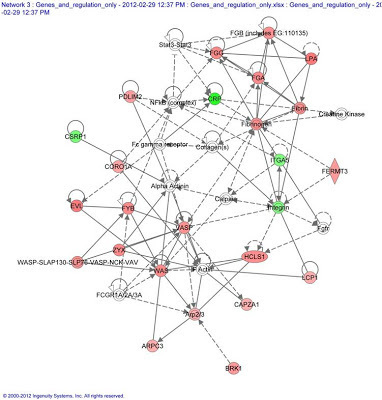 The spectra and protein reports are easily searched, well organized, and contain all the right information. I may post more after further study, but I just want to leave you here with this suggestion: Contact Protein Metric and check out this software. I think you will be impressed!